Do you have a friend that without fail finishes his holiday gift shopping sometime in late November? We are 100 percent sure that person is a Project Manager by trade. The rest of us think we are on top of the holiday gift giving until we hit the final week of the season and realize we were not as prepared as we thought. 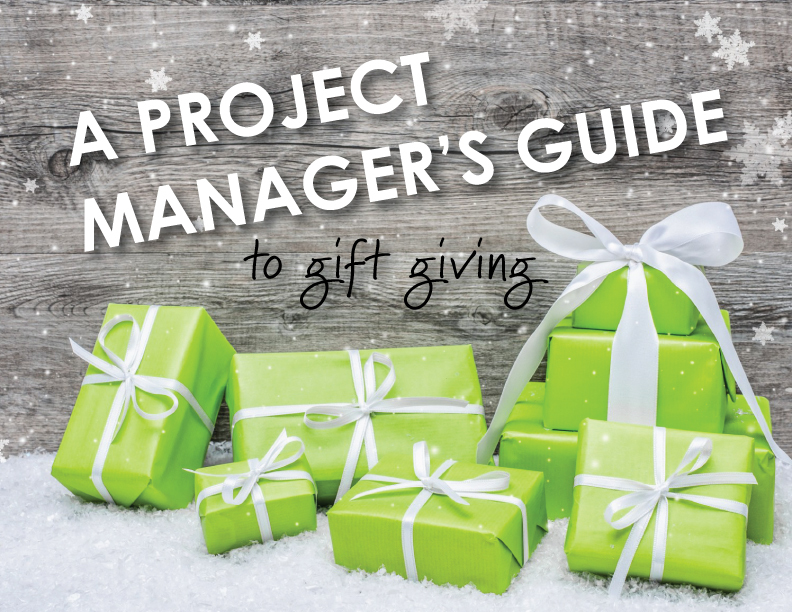 Since the only people we feel might pass the gift giving season with flying colors are Project Managers, we’ve jotted down a few ways PMs might approach gift giving that we all might be able to learn from. Most of us start the season with a few gifts in mind, a few jotted down on sticky notes on our desk, and have tossed around a couple of ideas with various family members or friends. These ideas, floating here and there will either become a reality or will disappear into the abyss of things we were hoping to remember. Project Managers take a typical todo list to another level. We imagine a PM starting their holiday gifting project by creating the ultimate Google Docs spreadsheet, with lists for each family member, friend, and coworker, and shared with appropriate parties. The best part about using a Google Doc spreadsheet to keep track of your holiday gifts list? You can look back on it next year as a reminder of what you gave and just how much you spent, if you want to go ahead and jot down the prices like a true PM would. Resource allocation is a Project Manager’s bread and butter. Project Managers are actually paid to know who is the best resource for performing what task and then see those tasks through. So gather your family members and turn them into resources! If your brother is the best at finding your dad a gift he will truly enjoy, lock him in early and hold him to his job. Put it on the spreadsheet. If you will handle the cousins for your mom while she manages the aunts and uncles, make sure she is on board so everyone is aware of their role. This part is where the best-meaning holiday gift givers fall short. If not enough wrapping time is allotted, or gift transportation is not considered, the whole thing can end in a big headache. Project Managers are execution pros, this is where they shine. Put your Project Manager hat on and rally all your resources to make sure they have completed their tasks successfully. Run a QA check to make sure your gift plan has been successfully accomplished on all levels, and last but not least make sure you have a change plan. A true Project Manager will store some generic, emergency gifts in their car in case they find themselves in need.